The newest addition to the Boston Skyline, 45 Province was designed to be ultra modern and ultra cool. From the Valet garage accessed by way of vehicle elevators to the indoor/outdoor, 4 season pool and the sleek finishes of the lobby, 45 Province is a unique achievement in urban design. The building features generous common outdoor space, 24 hour concierge and on-site fitness. 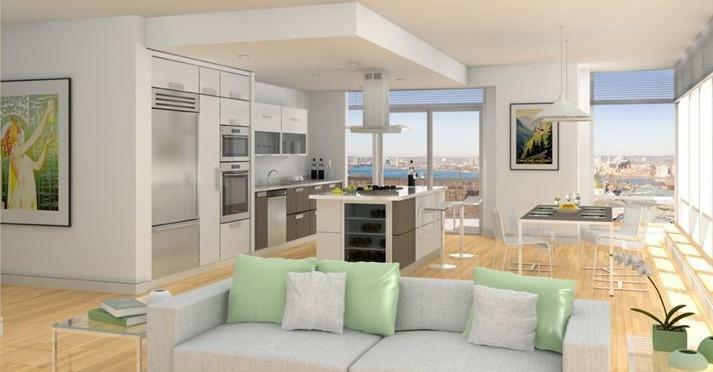 Units are designed to be open and lofty and feature over-sized windows with amazing views of Boston from it's heart. The building is located in the heart of downtown near the Financial District and within easy access to MGH. Red, Orange and Green train lines are located within a short walk. The Commons is 1 block away for those summer evening strolls. Have questions about the 45 Province condos on our site? Contact us to find out more or schedule a tour. You can also create a free account to start saving all of your favorite Boston condominiums. 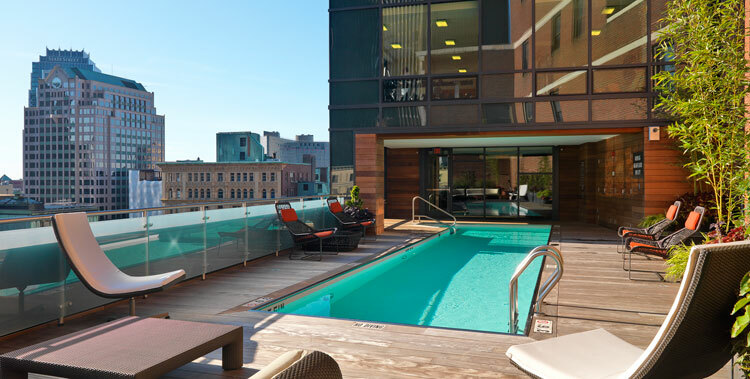 45 Province is a full service luxury residence located in the heart of downtown Boston. This 2 Bedroom 2 Bath Home features an open floor plan with a spacious living and dining area with great views. This residence also features a gourmet kitchen, in unit washer/dryer, floor to ceiling windows and valet parking. Building amenities are 24/7 concierge, rooftop patio, valet parking, heated pool, fitness center, Exhale spa treatment studio, private dining room, library lounge, theater screening room and more. Amazing location! Just steps to restaurants, theater, public transportation & shopping! This custom 1 plus or 2 bedroom, 1 full and 1 half bath loft style duplex is stunning and spacious with an open living, dining kitchen floor plan. Floor to ceiling, double height, walls of glass with East - South exposure fill the home with light and urban views. An open kitchen features custom cabinets, Sub-Zero and gas cooking. The bedroom offers a spa like bath with oversize shower and double vanity. The Study / 2nd bedroom, is lofted and now used as den, office, guest bedroom with a half wall of glass that's open to the first level. Hardwood floors throughout on lower level. Great value in the low PPSF and condo fee which includes parking and HVAC. 45 PROVINCE is a luxury boutique residence, pet friendly, with amenities including Club Level w/ Fireplace Parlor / Library Lounge, Dining Room w/ Catering Kitchen, Screening Room; heated pool, spa treatment room, fitness center and 33rd Floor roof deck! South to East exposure floods this home with light from floor to ceiling windows in every room offering panoramic views from the Harbor to the Financial District of this 2 bedroom, 2 full bath condominium home available for rent. Sub-Zero and Bosche appliances, Hardwood floors throughout. 1 Valet parking included. In the heart of Mid-town, 45 PROVINCE is a luxury boutique residence with hotel style amenities including 24/7 concierge, Fireplace Library Lounge, Dining Room with Catering Kitchen,, Screening Room; Pool, Exhale Spa Treatment Room, Fitness Center; 33rd Floor Roof Deck, Mast Restaurant, Haley Henry Wine Bar and more. Easy access to shopping, dining and minutes to The T, Logan Airport & all transit routes. This 2BR residence features direct elevator access, hardwood floors, floor-to-ceiling windows, open kitchen w/ Sub-Zero & Bosch and spacious living room with private balcony. 45 PROVINCE is located in the heart of downtown and offers amenities including a heated pool, fitness center, roof deck with unparalleled views of the Charles River and the Boston Common, private dining room / chef's catering kitchen, fireside library lounge, theatre screening room. One valet parking space included. Available July 1! 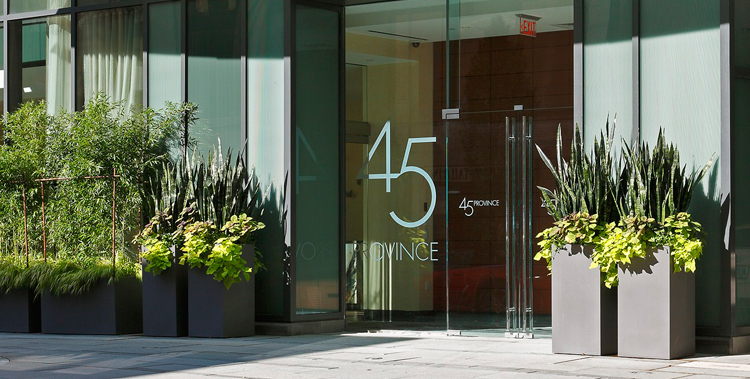 45 Province, Boston's luxury building located in the Midtown-Beacon Hill area. Elegant full service building with 24hr Concierge, on-site Exhale spa & Fitness center, Owner's Club Room, Library, Conference Room, Media Screening Room. Enjoy the Sunsets from the Amazing roof deck with Stunning views of the city, Charles River , Boston Common, Waterfront, Zakim Bridge... Wall of windows in this 23rd floor unit facing East offers stunning views of the city skyline. Unit features top of the line finishes, 2 bedrooms 2 full bath , Master bed. with walk-in closet and en suite bathroom. Bamboo floors throughout ,10ft ceilings, floor to ceiling windows, Enjoy the Gourmet full kitchen, with top of the line appliances, in-unit washer & dryer. On-site one valet parking included. 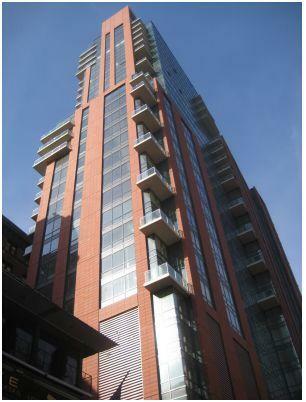 For your convenience Mast Italian Restaurant located on the ground floor of this luxurious High Rise building. Ideally located to shopping, dining & public transportation. Luxury 2 BR / 2 Bath condominium home for rent at prestigious 45 PROVINCE. Garage valet parking space included! Floor to ceiling windows from every room with Panoramic Harbor - Financial District views. South to East exposure floods this home with light and the open, flexible floor plan allows for the 2nd bedroom to be used as a study or bedroom. Open kitchen with custom cabinets, breakfast bar, Sub-Zero and Bosche. Hardwood floors throughout. 45 PROVINCE is a luxury boutique residence with 24/7 concierge and hotel style amenities such as Exhale spa and fitness studio, heated year-round pool, breathtaking 33rd floor roof deck, and Club Level with media screening room, residents' lounge and dining area. Located in the center of Downtown, 45 PROVINCE offers convenient access to the entire city, plus Mass Pike, airport, Rt. 93 and more. Midtown's premier boutique residence in the heart of The New Boston. Own the modern luxury & distinctive European flair at 45 Province w this premier, 2bd, 2bth home w warm plank bamboo floors, desirable, contemporary open design w bedrooms flanking the living area. Enjoy floor to ceiling windows in every room providing natural light. The modern floor plan offers outstanding living w a separate dining area if desired. A modern S/S & granite kitchen is a joy w custom Italian cabinetry & large center island. Live well w an oversized MBR w en-suite bath & walk in closet. The finest of luxury amenities are yours: 24/7 concierge, valet garage rental parking avail., heated seasonal pool, fitness center, Exhale Mind/Body Spa, media/screening room, child's playroom, 33rd floor roof terrace w panoramic water-city views, resident fireside lounge/library w caterer's kitchen. Lowest condo fees at $546 a month and a best value price for luxury at this level not seen in years make this a must see! Own the modern luxury & distinctive European style at 45 Province, Midtown's premier boutique residence. In the heart of The New Boston this premier corner, oversized 2bd, 2bth home w warm plank bamboo floors thru-out offers a flexible open design. Enjoy panoramic city & SE views from 9' floor to ceiling windows in every room providing exceptional natural light. The modern floor plan offers outstanding living space w an alcove dining area. Pocket doors are intelligently featured in the 2nd bdrm that open to reveal a huge space to entertain if desired. The Chef's gas kitchen is a joy w Sub Zero, Bosch appliances, custom Italian walnut cabinetry & a center island. A spa-like master bath has double vanities plus oversized rain shower. Finest of amenities include 24/7 concierge, valet parking, heated pool, fitness center, Exhale Mind/Body Spa, media/screening room, child's playroom, 33rd floor roof terrace w panoramic water-city views, resident fireside lounge/library w caterer's kitchen.